Hip In Detroit: Win Tickets to Bone Thugs-N-Harmony at The Garden Theater! Win Tickets to Bone Thugs-N-Harmony at The Garden Theater! 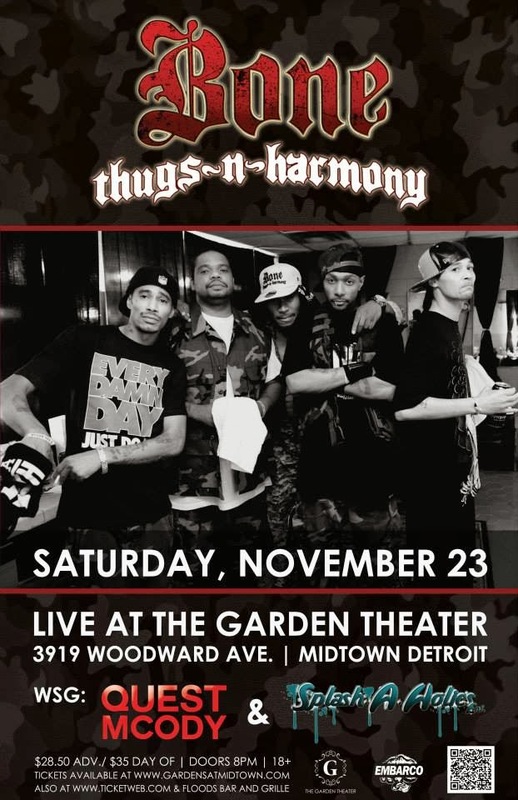 Wake up, wake up, wake up, Bone Thugs-N-Harmony are coming back to Detroit at the end of the month! Not only will you have a chance to hear "Crossroads" live, but you will also be able to check out a new venue, The Garden Theater. Actually, this isn't a new venue, but rather an old venue that is reopening its doors. This theater is located in Midtown and has a 1,300 person capacity. We're excited to see what it is all about. Bone Thugs are scheduled to play the new facility on November 23rd at 8 p.m. and the event is open to all those 18 and over. Tickets for the show are $28.50 in advance, but we have some to give away. Thanks to Embarco Entertainment we have two sets of tickets to mail out to two lucky winners before the show. To enter please email your full name and address to hipindetroit@gmail.com. We will draw two winners the week before the show and send them the tickets in advance. Good luck!